A series of tournaments and meetings with players, dedicated to the 70th anniversary of the Great victory continues! The next stage of the competition the company Wargaming will hold in Tula. 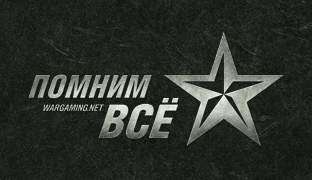 Players will have the opportunity to participate in the qualifying rounds and the winners of all team tournaments series converge in the final online battle on the eve of the Victory Day. Read more about the tournament series “Portraits of Victory” read here . Tournament will be held in two formats: a team competition and individual competition. individual competition takes place without prior registration. To take part in it can be anyone for free. Prizes from partners of the championship will be played not only among the participants, but also among the visitors. Moderators: Sergey streamer Vspishka Karapetyan and radio presenter Andrew Native TNT. Come forward to all! Opening of registration – March 26 . Closing registration – April 5 at 20:00 local time (UTC + 3) . Start online qualifiers – April 6 20:00 local time . Start offline games – April 12 at 12:00 local time . Location: Tula, pr. Lenina. 87, playpen central stadium “Arsenal” . The tournament is held in the format of 7/54 (“Attack / Defense”). Basically, the team must have at least six people from Tula and the Tula region. Players Wargaming . net League to participate are not allowed. team that submits an application is required to participate in the offline finals at full strength. In case of absence to the team and its players may be sanctioned. How to participate in the tournament . A detailed tournament regulations . Screenshots in violation of the Regulations . Maps of each stage of the qualifying published in the official competition regulations. I place – 450000 (per team ) + 7 Gaming Headset SteelSeries Siberia Elite 51127 black + 7 wireless mice Smartbuy 505AG (or 7 wireless mice Smartbuy 356AG chrome ) + 7 tank models for the assembly of Zvezda. II place – 350000 ( per team) + 7 Keyboard SteelSeries 6G v2 + 7-channel headphone SmartBuy® WILD LIFE. HOGGY + 7 tank models for the assembly of Zvezda. III place – 250000 (per team) + 7 gaming mouse SteelSeries Sensei Raw black laser + 7 tank models for the assembly of Zvezda. IV place – 150 000 (per team) + 7 gaming surfaces Mouse Pad SteelSeries SS QCK World of Tanks + 7 tank models for the assembly of Zvezda. I place – 50000 + Portable Drive HDD 2,5 “Smartbuy Basic 1TB USB 2.0 black + gaming multitasking monitor LG UltraWide Series UM55 + glasses for computer Gunnar. II place – 40000 + set “keyboard + mouse» Smartbuy 211703AG black + tablet Acer Iconia Tab 7 + glasses for computer Gunnar. III place – 30000 + Full-size headphones SmartBuy® PRESTIGE with integrated MP3-player + glasses Computer Gunnar. During the tournament in social networks will be held a special competition. Subscribe to our profile Instagram Take a picture from the event, put it in your profile with the hashtag #worldoftanks #tula #portretpobedy, show photos employee SMM-department directly at the event – and immediately get a bonus code. Subscribe to our Twitter , make a tweet that illuminates the event, with the hashtag #worldoftanks #tula #portretpobedy, show tweet SMM-employee department – and get a bonus code. And a special activity for all who remember their ancestors. Embark on a visit to veterans, their grandparents, give them flowers, listen to and record their stories of military past – and Do not forget to take photos! After that, place the story in special topic for discussion (be sure to include your nickname). The most interesting stories get into the album “Portraits of Victory”, and their authors will receive 500 . Attention! Do not take photos and stories from the Internet! Remuneration will be only those who actually visit their loved ones and write a unique story. Tula – largest city, located 193 kilometers south of Moscow. From late October to early December 1941, he withstood the blows of the German troops, being almost completely surrounded. Assault on the town the Germans laid on Panzer Group Guderian and the 2nd Army M. von Weichs. On October 30-31, the enemy launched a frontal assault on the town, but after a four-day of fierce fighting, it became clear that the plan failed. German troops attempted to bypass Tula from the south-east, but here they were stopped by the stubborn resistance of the Soviet troops. Moreover, on November 7, the Red Army was able to hit the flank of the advancing group. After another series of flanking attacks the Germans managed to take the city in poluokruzhenie, but grab it already happened. December 6 began Tula offensive operation conducted by forces of the left wing of the Western Front. Like everywhere in the winter of 1941-42, to encircle and destroy the German forces failed, the Red Army had yet to learn how to conduct major operations on the environment. However, the Soviet troops managed to throw the Germans for 130 kilometers to the west and to create opportunities for further development at the onset of Kaluga and Serpukhov. Battle of Smolensk in 1941 became one of the key defensive operations of the Red Army at the first stage of the Great Patriotic War. Battle of Smolensk was not a single battle, it was almost from dozens of smaller defensive battles: Bobruisk, Polotsk, and so Velikie. d. All of them had a common goal: to prevent the German breakthrough in the Moscow area. In turn, the Germans were planning to cut the Western Front, the main forces to encircle the Soviet grouping at Smolensk and destroy them, opening his way to the capital of the USSR. The Soviet command did not have time to create a strong and unified line of defense, sometimes there were significant gaps. The fighting began on July 10 and the first stage of the Germans managed to inflict significant damage to the Soviet troops. Were lost Mogilev, Orsha, shouting part of Smolensk and Elnya. From mid-July to early August, and the Red Army was able to turn the tide and even for a little while to get the opponent on the defensive. In August, the situation repeated itself – the Germans were advancing Soviet troops fought back and tried to counterattack. At the end of two months of fighting Soviet troops managed for a while to stop the advance of Army Group “Center”. On the morning of June 22, 1941, 4 hours and 15 minutes, at the Brest Fortress struck fire from German artillery. Strengthening turned into a trap for about nine thousand people, some of whom were civilians. Take the Brest Fortress was 45th Infantry Division of the Wehrmacht. The suddenness of the attack led to the fact that a unit of resistance in the fortress was not formed, the defenders were isolated in several points of defense. No chance that the castle will be able to leave, it was not. more or less organized resistance of the fortress continued until the end of June. Soviet soldiers had to withstand the day to 10 attacks. Huge problems with water were: to produce it, the men had to crawl their way at night with the bowlers to the river. June 29 fell East fort fortress. After that, there were only isolated within the group of Soviet soldiers and singles. One of the recent writing on the wall of the fortress dates back to July 20. According to the recollections of witnesses, some shots were heard in the beginning of August. Voronezh was under martial law from 22 June 1941. But the front was in the city only a year later. By June 1942 the city are increasingly subjected to air raids, and at the end of the month the Germans have moved in this direction in the offensive. Kick in the Kursk area and Ostrogozhsk, enemy troops have created a threatening situation for the forces of the Red Army and by 5 July reached the line of the Don River to the west and south of Voronezh. Because of not blown up the bridge in a timely Semiluki Germans crossed the Don and entered the city. At the first stage the core defense Voronezh made several regiments and battalions of NKVD troops, local militia and of the 232 th Infantry Division. On the streets of the city turned fierce battles in which not only drawn reinforcements special guides in Voronezh, but retreating part of the Southwestern Front. The Nazis were able to capture the right bank of the Voronezh, but beat the Soviet troops from the left bank to them so and failed. The only break Hitler’s troops on the left bank of the south of Voronezh was extinguished by destructive battalion; more such attempts did not take the enemy. Defense Voronezh lasted until January 1943, after which the forces of the Voronezh Front the city was liberated. In May 1942, the Germans managed to bring down the Soviet defenses on the southern sector of the front. The enemy began to rapidly move to the east, to the Don and Volga. One of the goals of the German offensive was Stalingrad (1961 – Volgograd). This city is an important industrial and communications hub of the USSR, it would mean the loss of insulation southern regions: Central Asia, Caucasus and Transcaucasia – from the rest of the country. From July 1942 to February 1943 was the Battle of Stalingrad – and one of the key battles of the Great Patriotic War. In the city were not only fighting for every house, but often at the individual rooms. Soldiers of the 62nd Army Chuikov V. bore the brunt of this confrontation. By mid-November, they kept the band just a few hundred meters wide, but to take full Stalingrad and the Germans could not. November 19, 1942 A massive Soviet offensive. Soviet troops defeated the Germans on the outskirts of the city, and in the Stalingrad encircled 6th Army F. Paulus. No escape from the boiler, or break through the encirclement from outside the Nazis failed. February 2 remaining German troops surrendered, Paulus was captured. The victory at Stalingrad, the Germans deprived the strategic initiative in the southern sector of the front and shattered relations with other countries, Germany’s Axis. Leningrad (1992 – St. Petersburg), the second largest city in the Soviet Union, was one of the main targets of the German troops. The largest scientific and industrial center, the node communications, the main base of the Baltic Fleet – the value of the city is difficult to overestimate. In September 1941, German troops reached the near approaches to Leningrad and closed the ring around the blockade. Storm the city Germans were not going to, they were planning to kill its defenders and civilians hunger. Leningrad was severely bombed and shelled. Winter of 1941-1942 supply the city with everything you need, including food, was at a critically low level. Rations of bread during this time dropped to 150-250 grams per day. In spite of everything, the Leningrad front not only protects, but also tried to attack. But only in 1943, Soviet troops were able to carry out a successful offensive “Spark”, which resulted in a broken sustainable land corridor through which it became possible to establish a suitable supply of all necessary to Leningrad. And in January 1944, the forces of the Leningrad, Volkhov and 2nd Baltic fronts, with the participation of the Baltic Fleet began a decisive offensive, finally throwing the enemy from Leningrad. Defense Krasnodar – part of Armavir-Maikop defensive operation in 1942. The fighting took place in the period from 7 to 14 August 1942. Soviet troops kept the defense on the Krasnodar contours – a specially constructed defensive line. The Germans planned to break his strike four infantry divisions supported by tanks. Realize they did not succeed, however, the Red Army was forced to retreat to the left bank of the Kuban River, and then leave the city. The Germans entered the Krasnodar August 10, 1942. After fierce fighting, which lasted two days, the Red Army had to leave the city. Soviet defense broke in the area of ​​the city, threatening seizure of strategically important crossing over the Kuban, but the Soviets did not give the opponent a chance to use it. Thus, the Germans were no longer able to carry out a strategic plan for the destruction of the main forces of the North Caucasus Front. After another month of hard fighting, the Germans moved to this area to strategic defense. The city was in occupation until 12 February 1943 and was released in the Krasnodar offensive. Moscow, the capital of the Soviet Union, was the largest industrial and scientific city in the country, its main communication hub. In addition, its capture would be a powerful ideological achievement Germany. Defense of Moscow was the primary task of the Soviet command. September 30, 1941 the Germans launched a general attack on the Moscow – operation “Typhoon”. Initially, the fighting evolved very unfortunate for the Soviet troops. The Germans brought down the defenses of the Bryansk Front, surrounded by more than 680 thousand people in the area of ​​Vyazma, the end of October brought down defenders with Mozhaisk defense line. At the critical moment German troops were so close to Moscow, the city could be seen with binoculars. This achievement was given the Wehrmacht high price. Division of Army Group “Center” were exhausted and suffered huge losses. Soviet commanders, in turn, not only managed to keep the enemy’s advance, but also to accumulate power for their own counteroffensive. To his top 5 December 1941 the number of troops of the Red Army, ready to strike back, was more than 1 million people. As a result of the counter-offensive, German troops were driven from Moscow to 100-250 kilometers. Were completely exempt Tula, Moscow and Ryazan regions, partly – Kalinin, Smolensk and Orel. Minsk was the largest industrial, transport and administrative center of the Byelorussian SSR. He was one of the first Soviet cities took the brunt of the German troops. The enemy was on the approaches to Minsk for 25 June 1941, three days after the outbreak of war. After another three days the city was captured by the enemy. For three years, during which Minsk was in the German occupation, he became one of the centers of the underground movement in Belarus. It printed and distributed leaflets with anti-Hitler propaganda and Sovinformburo. Published two underground newspapers – “Zvezda” and “Minsk Bolshevik.” September 22, 1943 in Minsk underground eliminated Gauleiter of Belarus Wilhelm Kube. Between the Minsk underground and Belarusian partisans had close ties. Before the start of the Soviet offensive in the summer of 1944 within the Minsk underground operations were able to defuse many of the buildings, the Germans prepared for the explosion. Minsk was liberated from the enemy July 3, 1944.